Welcome to our regular round-up of the best hotel promotions currently running. This has run slightly later than usual this month, but it does not make major difference as most of the offers featured continue into December. All of the information in this article can also be found on our ‘Hotel Promos’ page which contains details of all of the current offers, together with links to our major articles on each hotel scheme. However, a positive response from readers – especially our 12,300 email subscribers – means I am now running this monthly article as a handy summary of what is going on. Where should you credit your stays in November? Firstly, we should remind you that until tomorrow, 14th November, Head for Points is running an exclusive offer with Kaligo.com. You will earn 10,000 Avios if you book £700 of rooms for stays until June 2019. Full details are in this article – don’t miss it! Over at the big brands, and with all of the Autumn promotions now launched, we have a clear view of what IHG, Hilton, Accor, World of Hyatt and Marriott / Starwood will run until the end of the year. Marriott / Starwood are offering 2000 bonus points per stay but you must stay 2+ nights, and if you are at expensive hotels the bonus looks a little puny. World of Hyatt is offering a bonus which build as you stay more, so you will need to commit to a lot of nights to really start seeing value. Accor does not have a global promotion at the moment but is offering triple Avios until 31st December if you choose to automatically convert the points from your stays. The new offer is called Double Points Plus More. It runs from 16th September to 31st December. It is simple. You earn double base points from your 2nd stay. There are additional personalised targets which could be worth a lot more. The original cap of 15,000 bonus points has been removed and there is now no limit on what bonus you can earn. PS. I expect a new batch of heavily discounted PointBreaks redemptions to launch on the last Monday in November. We will cover them on HFP. Le Club AccorHotels, the loyalty scheme for Ibis / Novotel / Sofitel / Mecure etc, is running a special Avios promotion at the moment. There is no global points offer however. Your will earn triple Avios on every stay before 31st December. Your earning rate varies by brand but will generally get you 7.5 Avios for every €1 you spend. Full details are on the Accor website here. Registration is not needed. The one negative point is that existing bookings made before 10th October do not count. You should rebook as long as your rate is flexible and the price has not gone up. This promotion is running with Iberia Plus. Whilst there is also a British Airways version, you want to credit to Iberia Plus because the exchange rate is double. Accor points transfer 1:1 into Iberia Plus whilst they only transfer at 2:1 into British Airways Executive Club. My full article on the triple Avios promotion is here. You can find out more via the Accor website here. It runs from 1st September to 30th November although registration closes this week, on 15th November. PS. If you booking a luxury hotel, remember that we can offer you exclusive additional benefits at Four Seasons, Mandarin Oriental, Peninsula and similar hotels. Click here for details of our luxury hotel booking service in association with Bon Vivant / Virtuoso. Feedback from readers who have used this service so far has been excellent and we have booked over £890,000 of rooms so far. With the IHG offer, does the upto 15000 bonus have to be fully allocated for it to count as a completed target? I would have thought with the way it’s worded that so long as there were some points there, as in staying at least two nights then it would. However so far I have three stays completed and the promotion page states that I’m 32% complete with the last two stays listed? Sadly as I understand it you need all 15000 base points to complete the target. I think so! I read it the other way too! so need a lot more spend to get my bonus 60K for completing all! Hilton’s 35% South East Asia sale is a joke. The hotel I’ve been checking prices was around $750 per night, moved to $840 last week and today in the sale, it says $916! Says flash sale next to the sale price! The date checked was the same. 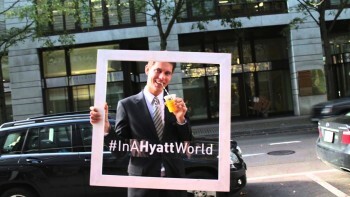 Am I the only one who strongly dislikes the Hyatt image? It certainly doesn’t make me think “I want to stay with them”. Re the Corporate Rate target with IHG. I had this target in the last Accelerate promo period. Which was odd as I didn’t believe I had ever utilised one. However, when I returned from a FHR stay in the IC Carlton Cannes in May it triggered 33% complete on the Corporate Rate target. Didn’t get a chance to test it again but am wondering if anybody else has experienced this? Posted this the other day but bottomed. If i stay over the shoulder of the Hilton promo dates (2nd to 5th Jan) how many nights do I get double points on? In the past I have used SPG points to obtain lounge access in hotels in Hawaii and Los Angeles. Does anybody have experience or knowledge as to whether this can be done at their hotels in New York since the Marriott merger ? OT/ When do the Marriott Status years run? i.e Jan-Dec? or something else? I was given Premier Elite earlier this year and want to Book a hotel for Early January. I really only want to book if I can get the late check-out benefits for a 8PM flight home. Do you get a soft landing with Marriott? or straight back to the start? Now that my Avios account has been closed the Lloyds upgrade vouchers are no longer visible. Fortunately I anticipated this and recorded the details otherwise it would be easy to forget to use them. I suggest that anyone who has vouchers and the Avios account is still open does the same. It looks like IHG have today amended the Double Points bonus to ‘Unlimited’, according to their homepage. Best promo is clearly Best Western’s 10K Points any hotel in the US. !